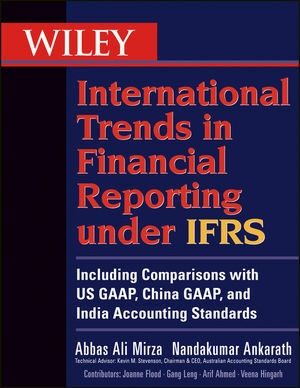 Wiley International Financial Reporting Trends provides copious examples of footnote disclosures and financial statement formats, carefully culled from the world's leading international companies ("Global 500") that are already compliant with IFRS and report under IFRS standards promulgated by the International Accounting Standards Board, the IASB. Arranged topically, this book is a quick source of reference to find answers to issues of interest to financial statement preparers. It provides hundreds of illustrations taken from financial statements prepared under IFRS by global conglomerates thereby helping preparers and users of financial statements to expeditiously obtain examples of footnote disclosures and financial statements presented under these Standards which are popularly referred to as "principles-based" standards (as opposed to "rules-based" standards). Additionally, Wiley International Financial Reporting Trends contains comparisons of IFRS to US GAAP, Indian GAAP, and Chinese GAAP, making it a truly global reference resource. ABBAS ALI MIRZA, CPA, ACA, AICWA, is a Partner in Deloitte & Touche, Dubai, UAE, and a member of the firm's regional Assurance and Advisory Committee. Mirza is Chairman of the Auditors Group of the Dubai Chamber of Commerce and Industry and was the chairman of the Intergovernmental Working Group of Experts on International Standards of Accounting and Reporting (ISAR) at the United Nations. NANDAKUMAR ANKARATH is a Fellow Member of the Institute of Chartered Accountants of India and a Senior Partner with Moore Stephens, Chartered Accountants, United Arab Emirates. Nandakumar has over twenty-five years of post-qualification experience in auditing, accounting, financial, and management consultancy in various business environments in India, Bahrain, and the United Arab Emirates. He has served as a member of the Committee on Accounting Standards for Local Bodies formed by the governing body of the Institute of Chartered Accountants of India to formulate accounting standards for local, autonomous, and nonprofit organizations in India. He is also the coauthor of Understanding IFRS Fundamentals: International Financial Reporting Standards, published by Wiley.